The Carey Panthers (3-2, 1-1 league) whipped up a winning formula on the gridiron Friday. They came away with a 52-30 non-conference eight-man football victory over the visiting Carlin (Nev.) Railroaders (1-4) on a mild evening at Carey’s Derrick Parke Memorial Field. For the second straight week, Carey scored seven touchdowns in a game. The offensive resurgence against Carlin was a combination of grind-it-out offense, excellent special teams play and capitalizing on turnovers. The Panthers had 256 rushing yards, 134 passing yards and 133 in returns. The team’s effort pleased 12th-year head coach Lane Kirkland (99-22), who will aim for his 100th coaching victory today, Wednesday, Oct. 3 at 7 p.m. when Carey visits Richfield for a pivotal Sawtooth Conference North contest. Carey junior Luis Garcia rushed for 120 yards, scored three touchdowns and added a pair of two-point conversions. Senior quarterback Jordan Dilworth (10-for-15, 134 yards, 2 TD) directed the 523-yard Panther attack. And the Panthers succeeded on five of their seven two-point conversions. Sophomore Nate Adamson caught two Dilworth TD passes, from 11 and 6 yards. Juniors Tori Alvarez (50 rushing yards, 1 TD, 109 yards returns, 2 fumble recoveries) and Christian Zarate (60 rushing yards) pitched in, while Francisco Gamino (10 tackles) and Matt Whitworth (9) led the defense. Senior running back Chance Moen of Carlin (18 carries, 262 yards) slipped away for TD runs of 69, 98 and 48 yards, piling up a good chunk of the 364 rushing yards by the Railroaders. 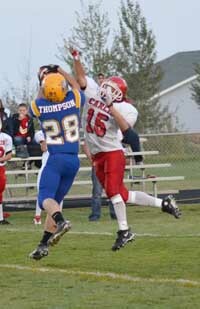 But Carey built an early 24-0 lead and kept scoring after Carlin sliced its deficit to 30-18. Alvarez’s 79-yard kickoff return to start the game set up Carey’s first TD, scored by Garcia. Alvarez then recovered Carey’s onsides kick and Dilworth finished a seven-play, 50-yard TD drive with a 1-yard plunge. A solid four-and-out stop by the Panther defense set the stage for a 10-play, 77-yard TD drive with Alvarez accounting for the final 25 yards. Carey led 24-0 with big first-quarter statistical advantages—28-9 in offensive plays, 9-0 first downs, 252-96 in total yardage and 9:30-2:30 time. The Railroaders rallied by scoring three of the next four TDs, two scores on long Moen runs and one TD on a nine-play, 74-yard drive. But Carey lineman Gamino made a clutch fourth-down tackle to stop Carlin’s first possession of the second half, then Whitworth made his own fourth-down stop and stalled Carlin’s second possession with the score still tied 30-18. Less than three minutes remained in the third period when Carey punter Gunner Thompson (3 punts averaging 44.0 yards) backed Carlin up with a kick into the end zone. On the second Railroaders play, Alvarez pounced on a fumble and Carey stretched its lead to 38-18 on Garcia’s second TD run. One more Carey defensive stop and another Garcia TD made it 46-18. To achieve its goal of making the State 1A Division 2 playoffs, Carey will now have to win at Richfield (1-2, 1-0 league). The Tigers are averaging 45.3 ppg after beating Camas County 54-6 at home last Friday behind the 200-plus rushing effort of Zak Wood, who scored six TDs. Meanwhile, Carey’s “Senior Night” home football finale against Camas County of Fairfield (2-2, 0-2) on Friday, Oct. 12 will also feature a breast cancer awareness theme. The Panther varsity cheerleaders are now accepting pre-orders at $12 per shirt for black-colored t-shirts with Carey High School logo and “Pink Panther” design. Fans are asked to wear them for the football game and also for the home “Senior Night” volleyball match against Castleford on Thursday, Oct. 11. Rushing—Luis Garcia 20-120 (6.0 per carry), 5 1sts, 3 TD, 1 conv. ; Tori Alvarez 19-50, 3 1sts, 1 TD; Christian Zarate 10-60, 2 1sts; Jordan Dilworth 7-25, 3 1sts, 1 TD; Dallin Dilworth 1-1; Corban Johnson 2-0. Passing—Jordan Dilworth 10-15, 134 yards, 3 1sts, 2 TD, 4 conv. Receiving—Luis Garcia 2-37, 1 1st, 1 conv. ; Patrick Baird 1-33, 1 1st; Gunner Thompson 2-32, 1 1st, 1 conv. ; Nate Adamson 2-17, 2 TD; Tori Alvarez 3-15, 2 conv. Kickoff returns—Tori Alvarez 3-91; Joe Parke 1-24. All-purpose yardage—Luis Garcia 157, Jordan Dilworth 159. Tackles (54)—Francisco Gamino 10, Matt Whitworth 9, Jordan Dilworth 8, Glen Andrews 8, Tori Alvarez 6, Gunner Thompson 4, Luis Garcia 3, Christian Zarate 3, Joe Parke 3. Rushing—Chance Moen 18-262 (14.6 per carry), 1 1st, 3 TD; Jacob Pengilly 5-74, 1 TD; Blade Lester 8-21, 2 1sts; Christian Taylor 1-5; Jacob Burris-Blaine 2-2. Passing—Jacob Burris-Blaine 5-20, 63 yards, 2 1sts, 1 TD, 1 intercepted; Dennis Branning 0-1, 1 intercepted. Receiving—Antonio Macias 1-46, 1 1st; Robert Kitts 2-13, 1 1st; Blade Lester 2-4, 1 TD. Fumble recoveries (1)—Jordon Stills 1. Kickoff returns—Jacob Pengilly 2-10; Chance Moen 1-12; Robert Kitts 1-10; Antonio Macias 1-5. Tackles (79)—Jacob Pengilly 15, Jordon Stills 14, Robert Kitts 12, Blade Lester 10, Antonio Macias 6, Jacob Burris-Blaine 6, Roger Anderson 5, Keaton House 3, Jerin Gunnels 3, Caleb Lott 2, Chance Moen 2, Casey Ross 1. Touchdown passes—Jordan Dilworth 6. Conversion passes—Jordan Dilworth 10. Notes—Carey has scored in 15 of 19 quarters....Carey has successfully made 16 of 24 conversions (67% success rate)....Carey has scored 25 TD—17 on runs from scrimmage, 6 on passes, 1 on defense, 1 on kickoff or punt returns.